This is a technical resource book written for self-directed traders who want to understand the scientific underpinnings of the filters and indicators they use in their trading decisions. There is plenty of theory and years of research behind the unique solutions provided in this book, but the emphasis is on simplicity rather than mathematical purity. In particular, the solutions use a pragmatic approach to attain effective trading results. 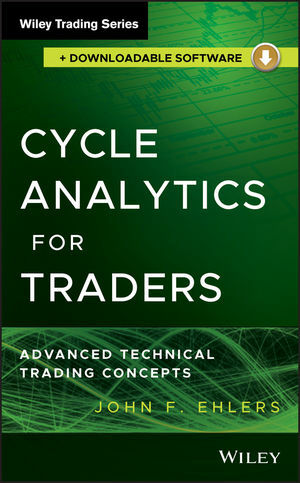 Cycle Analytics for Traders will allow traders to think of their indicators and trading strategies in the frequency domain as well as their motions in the time domain. This new viewpoint will enable them to select the most efficient filter lengths for the job at hand. John F. Ehlers worked as an electrical engineer at one of the largest aerospace companies in the industry before retiring as a senior engineering fellow. A graduate of the University of Missouri, he has been a private trader since 1976, specializing in technical analysis. The discoverer of Maximum Entropy Spectrum Analysis, he writes extensively on technical trading and speaks internationally on the subject.